FoodThoughtsOfaChefWannabe: Guest Post - It's Yummilicious! Coffee Rubbed Turkey Burgers! Guest Post - It's Yummilicious! 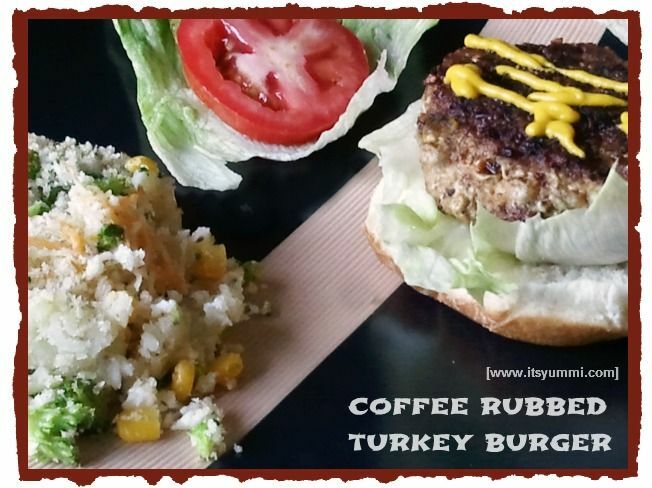 Coffee Rubbed Turkey Burgers! Hi Everyone! As Chris may have already mentioned, my name is Becca. I've been given the tremendous honor of posting a recipe for you while Chris is off vacationing with her family this week! When I heard that she was looking for some help, I jumped up and down and waved my arms around in the air because she’s helped me out on SO many occasions that I wanted to be first in line to help HER out for a change! I'm hopeful that she’s having a blast and will return to her kitchen refreshed, renewed, and ready for more fun! Chris asked me if I would make up something with a coffee rub to show all of you today. Apparently, she must have a fear of cooking with coffee, which I can appreciate, but totally don’t get. I mean, let’s call it what it is…it’s coffee. It’s a cup of black, liquid gold. A jolt-you-out-of-bed cup of loveliness! What’s to fear? OK, this is GROUND coffee, but it’s really harmless and OH SO DELICIOUS! Coffee adds a depth of flavor that perks up anything it’s paired with. Like these turkey burgers! Over at It's Yummilicious, I try to share a balance of healthy and sinfully delicious recipes. Be that as it may, I TYPICALLY tend to lean a little more towards the sinful side, primarily because I love baking so much. However, I snapped the elastic on another pair of stretchy pants a couple of weeks ago, forcing me to take a cold hard look in the mirror and I did NOT like what I saw. I decided that I have been eating “all things in moderation” very well, so I’ve put myself on a healthy eating plan for a while. 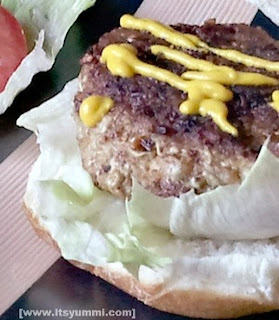 That’s why this recipe for coffee rubbed turkey burgers is so awesome. The burgers are packed with spices and grilled up until they’re juicy and incredibly Yummilicious. The very best part of the deal is that you can fix these burgers up with any toppings of your choice. If you like the flavors of good BBQ, add a little sauce to the top of your burgers. If you’re a cheesy person, stuff these babies with some shredded or crumbled cheese… YUM! In my particular case, BACON was calling my name, but I just wanted to be able to taste the tender turkey in all of its java-loaded glory, so I stuck with the basics…. a little yellow mustard, some lettuce and tomato. WHAM BAM… a big grand slam! In a spice grinder, food processor, or using a mortar & pestle, combine all of the spices. (If you don’t have any of those tools, place the spices into a zip-top plastic bag and close the top. Use a rolling pin to crush and blend the spices together. Liberally apply the seasoning blend to both sides of each patty. Rub the spices in so that it will form a nice crust when you cook it. The burgers can be grilled, fried in a pan, or even cooked under a broiler. Be sure to use proper food safety practices by cooking them until the juices run clear and the internal temperature reaches at least 165 degrees for optimal safety. Thanks so much for allowing me to cook in your kitchen, Chris! It's an honor for me to help you out!